You could be forgiven for not knowing this restaurant was existed. Tucked away in a strip mall on Highway 127 in Hickory, the outside of this restaurant barely hints at the high quality food inside. But once you’ve found it, you’ll want to go back again and again. We were first presented with a Poke (po-kay) Paddle. 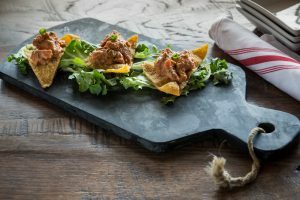 This star of this appetizer is the ahi tuna, and it’s some of the most tender I’ve ever tasted. It’s mixed with a sesame soy glaze that offered a satisfying kick that wasn’t overwhelming. This was served over crisp wonton strips and fresh greens, and offered an exciting start to our dining experience. 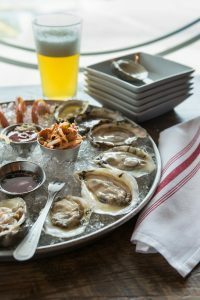 Standard Oyster Company shines brightest when it comes to their fresh, raw oysters. A chalkboard describes each of at least 10 varieties of oysters, telling us where they came from and describing their taste and texture. The Standard Platter gave us an opportunity to sample a selection of their most popular appetizers. We chose Olde Salts oysters from Chincoteage Virginia. The board said they were extra salty, and eating them tasted like swimming in the ocean. We also ordered Pirate Pearls, from Bayboro, NC. These plump and mild oysters were gentle and palatable. The tray is rounded out with cherrystone clams and a ceviche made with salmon and cucumbers. An exciting burst of flavor is offered by the mignotte, which is made with red wine vinegar, shallots and spices. The Low Country Boil is a favorite in the Foothills. This one is nearly perfect. Steamed oysters provide the base for this dish, and these are from Appalachiacola Florida. 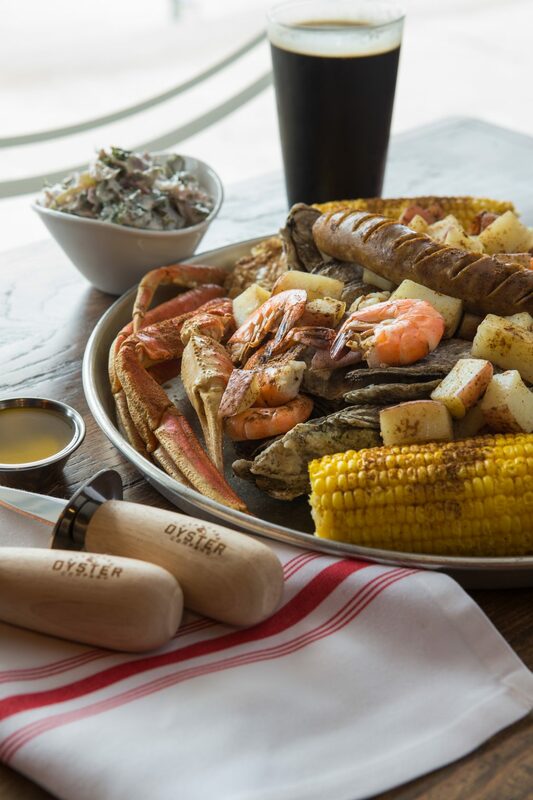 Alaskan Snow Crab Legs and plump shrimp are seasoned, along with andoulle sausage are perfectly seasoned with a house blend of spices which remind me of the Old Bay I remember, but with a deeper base note. Potatoes and corn are also added to the mix, which is steamed until the flavors blend just so. 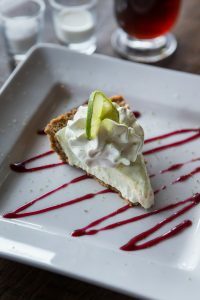 Dessert was truly delightful-a key lime pie that was simple, tart, and light. It was served with coffee that was flavorful and rich. The attention to detail was apparent throughout, and appreciated. 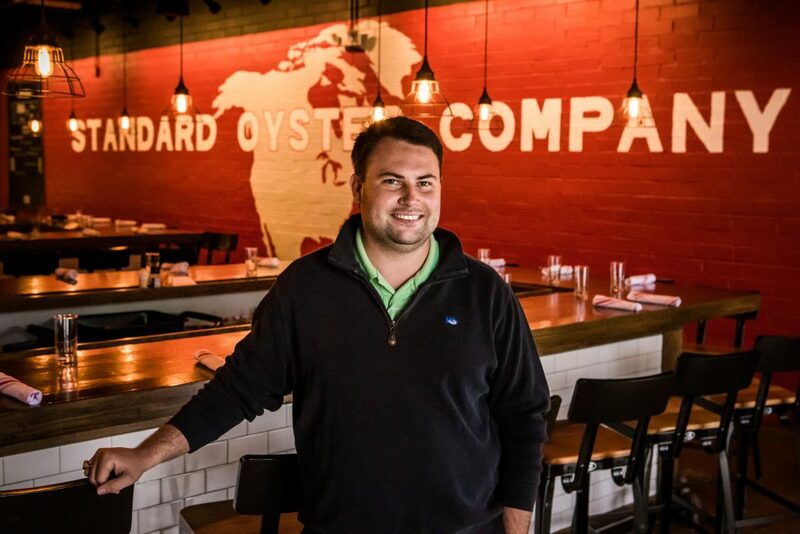 Established in 2016, Standard Oyster Company is stll a new restaurant. But it’s apparent that they’ve already found their stride. The aesthetic of the restaurant is unique, and the floorplan lacks tables, instead focusing on an all-bar layout. People truly seem to enjoy conversing with folks near them, and even the servers were happy. Of note, the restaurant has retained almost all of their original staff-a rare feat considering the rapid turnover in the industry.